Acid-staining is primarily done on interior floors, such as finished basements and retail or commercial business settings, but one great, relatively overlooked application for acid stain is residential concrete driveways, where the marbled stone finish of acid stain creates a colorful, more inviting look for an entryway to a home, and can vastly increase the real estate value of the property. Because most people don’t know much about finished concrete driveway treatments, they leave their driveways uncolored and uncoated, or have stamped concrete installed, which is very difficult to keep clean, and chips and spalls easily, especially in northern, Midwestern climates. This is a driveway that was saw-cut with a pattern, and then acid-stained, so as to create a South-western motif that would complement the architectural style of the residence. One of the main reasons homeowners don’t consider finished concrete driveway treatments, like acid staining, is the unsightly accumulation of tire marks, vehicle fluid leaks, settlement cracks, grime and other dark stains on their driveway that arise out of normal driveway activity. Ugly driveway concrete is discouraging, accepted as normal and may seem impossible to do anything about. But blemishing and discoloration, like this, can be removed from the concrete prior to acid staining; and once stained, the colored concrete is protected by a clear sealer that will preserve the color of the stain; repel moisture, oil and dirt; inhibit or block the UV rays of the sun and the effect of acid rain; and allow the driveway to be easily cleaned of any contaminants. 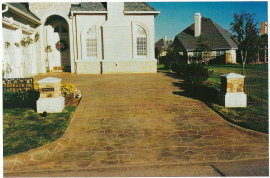 This driveway has a pattern that was stenciled on with a thin cement overlay before acid-staining. You can see how the beauty and contrast of the driveway seems to make the home stand out in "isolated elegance". Even if marks or discoloration on the driveway cannot be completely eradicated prior to staining - or something does later happen to the sealed, acid-stained concrete - they are are much less noticeable on colored concrete, or generally can easily be removed from the surface of the sealer. In addition, the care and maintenance of acid-stained concrete driveways is not difficult: it consists primarily of occasional pressure-washing, or mild scrubbing and rinsing with a garden hose. Re-sealing a finished concrete driveway treatment, like acid-stain, is usually only required every few years with one or two coats of a quality sealer - similar to the resealing of a backyard wood deck or stamped concrete patio. Best of all, the acid-staining of all outdoor concrete surfaces - including driveways, walkways, patios and pool decks - is extremely durable: the color will not fade due to UV exposure, whereas water-based stains and dyes, similar to those used on wood decks, always do fade and eventually need to be touched up, re-coated or recolored. The most common acid-stain colors used on driveways are gold, terra cotta and brown, and these colors can accented or complemented by another color, using a border, basic design or saw-cut pattern. Here are some acid-stain color charts to give you an overall idea of the available color options: Artcrete Faux Brick and CSI Chromastain .